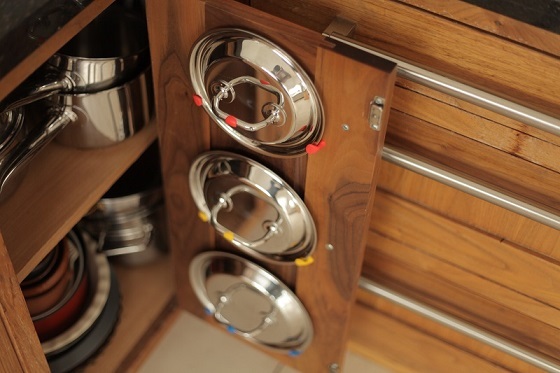 Conquer the kitchen chaos with this easy idea for organising your pot lids. Watch this video and learn how to hang them from the back of your cupboard door. Anyone who spends any time cooking will tell you, organisation is the key to a calm kitchen. With a little help from Sugru, you’ll be able to spend less time hunting through a jumbled cupboard and more time preparing the perfect meal. And you’ll be able to match lids to the correct saucepan quickly and easily. For each lid holder, you’ll need one single-use pack of Sugru. Need to stock up? Head over to our online shop! Step 1 – Open your packet and divide your Sugru into 3 pieces (2 big, 1 small). Step 3 – Shape into a pyramid and then into a hook using your saucepan lid as a sizing guide. Top Tip: Follow our handy hooks guide for the best way to make Sugru hooks. Step 4 – Add the final small piece of Sugru to your saucepan lid for colour coordination and leave to set. In 24 hours, you’ll be one step closer to making the most of the space in your kitchen! Sugru is ideal for this project because it sticks to surfaces you&apos;ll find in your kitchen, like ceramic, steel and wood without the need for drilling. And because Sugru is removable, you can always take your hooks off again if you ever move home or buy new pans. So why stop at just pot lids? You can make anything in your kitchen work better for you.